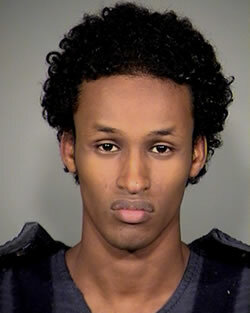 A Somali-American who claimed the FBI manipulated him to detonate what he thought was a bomb at a Christmas tree ceremony in Portland in 2010 was found guilty Thursday of terrorism-related charges, the Associated Press reports. The Mohamed Mohamud, 21, who did not testify, will be sentenced May 14. Prosecutors were able to convince jurors that Mohamud intended to kill a lot of people in the name of radical Islam and that he was not entrapped by FBI agents who offered to help him create a bomb, the AP reported. Mohamud’s attorney, Steve Sady, said he plans to appeal after sentencing on May 14. Posted: 2/1/13 at 3:24 PM under FBI, News Story.